The following options are available for the SunSeeker UltraSlim retractable sliding-stacking patio doors range: Slide-Pivot and DG-Frameless. 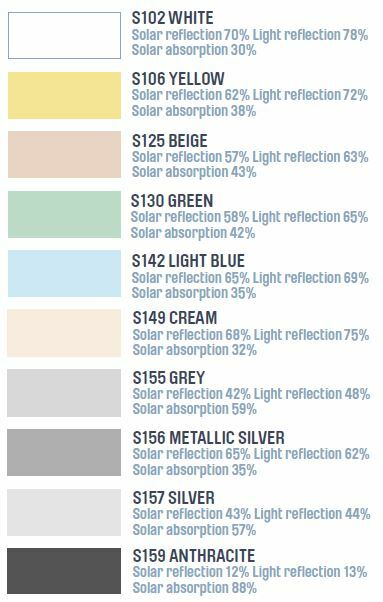 Although SunSeeker Doors’ UltraSlim aluminium frames are less dominant than those from other manufacturers, their colour may be of great importance to your property and your lifestyle. We supply UltraSlim frames in anthracite grey or natural pure white as standard, but we have the facility to powder-coat aluminium door frames in our premises in a choice of industry-standard RAL colours at additional cost. The finished frames, whatever colour you choose, are virtually maintenance free and will never require painting or varnishing – ever. 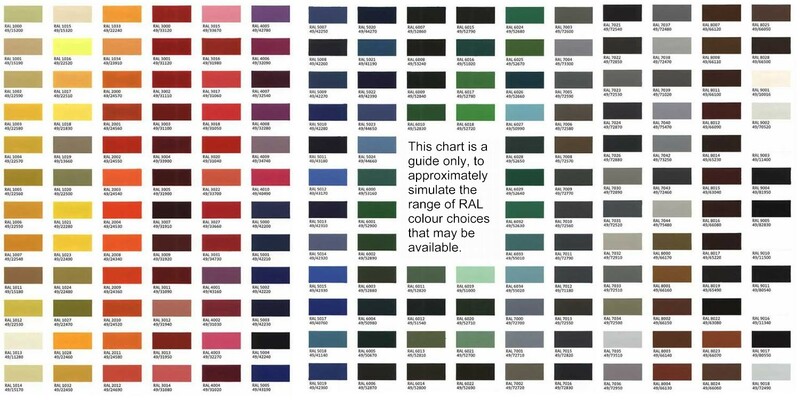 Click on the RAL images to view the standard of approximately 200 colour options. Note that this is a guide only, as colours will look different on each monitor and printer, depending on the various settings. 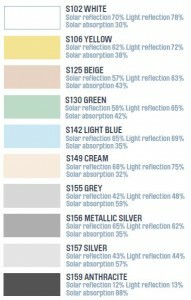 Some RAL colours can be considerably more expensive than our standard selection, depending on the cost of raw materials. Please note that colour representations vary on different computer screens. These images are given as a guide only. 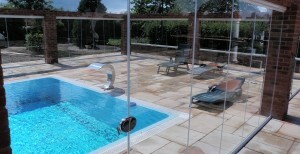 Our retractable door systems with a low cill are available as internal room partitions as well as for patio doors e.g. 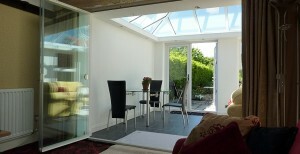 we have installed UltraSlim doors between house and conservatory. When fully open, the narrow profiles ensure the maximum access and light flow. When closed, the narrow frames allow more light and better view than with pvc or wood alternatives. The Uni-Blinds systems are permanently sealed within the double glazing cavity, a totally dust-free environment, therefore the blinds require no cleaning, are protected from damage and always look and work like new. Uni-Blinds provide greatly enhanced sunshading features compared with a separately fitted blind, never flap around in a draught and enhance the u-value of a sealed unit. Integrated blinds carry a longer guarantee than regular, externally fitted blinds. Uni-Blinds venetian and pleated blinds are specifically designed for use in double glazed units, manufactured in accordance with high technical specifications and stringent production standards. The slat raising, lowering and tilting functions are achieved using a rotational magnetic transmission through the glass, guaranteeing the glazed units hermetic seal. 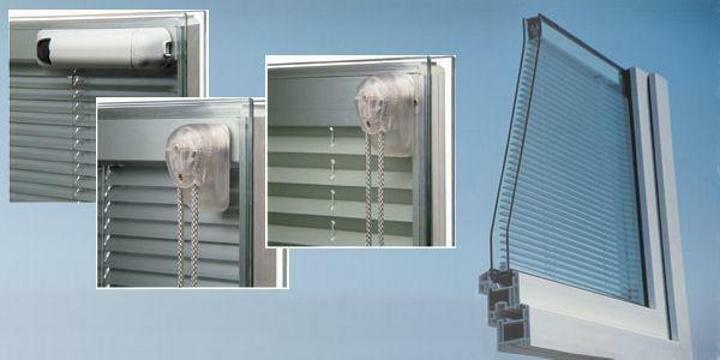 Raising and lowering of integrated blinds is achieved with a continuous cord loop that drives the external magnet. The cord is held lightly under tension by a cord tensioner on the glass directly below the external magnet. The external magnet can be fixed to the glass by double-sided high performance adhesive and gives perfect alignment with the internal magnet. Alternatively, the magnetic unit can remain unattached except when required, leaving an attractive, cord-free view. Uni-Blinds are available in two different styles and various colourways. A choice, based upon end use and personal preference, can be made between the continuous pleated option, with a choice of two colourways, or the venetian slatted blind in a choice of three colours as standard. All the blinds are fully colour co-ordinated within the cavity and have white external controls. An electrically operated system with numerous options is also available. The components used in the production of Uni-Blinds kits for assembly inside the double glazed unit have been specially designed to avoid the release of substances that can jeopardise transparency of the glass (fogging effect) in compliance with BSEN 1279 regulation. External Institute Certification approval and Pellini’s own laboratory testing of this feature controls the incoming quality of materials to ensure compliance with agreed standards. Quality control personnel follow the procedures in accordance with the internal control scheme (ISO 9000). Laboratory tests are performed to verify that the materials are compatible with their use in the double glazed unit. *NEW* Roller Shutters – click here! Please ask if you have a requirement not shown above.